Sutton Bank is a high vantage point at the very edge of the Hambleton Hills and the North York Moors with extensive views over the Vale of York and the Vale of Mowbray. Because of its location and high elevation, Sutton Bank is popular with gliding and flying enthusiasts who take off from a small airfield which is located at the top of the bank. 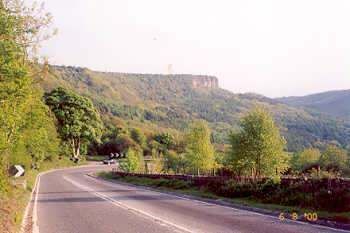 Predominant landmarks include Whitestone Cliff and Roulston Scar, the former overlooking the mysterious (and reputedly bottomless!) Lake Gormire. Close nearby are the villages of Sutton-under-Whitestonecliff, and Kilburn - famous for the White Horse of Kilburn, and Robert Thompson (the "Mouseman" of Kilburn). The main A170 truck road ascends Sutton Bank en route from Thirsk to Pickering and Scarborough, though there are warnings about the steep gradients and caravan towing is not allowed. Sutton Bank is classed as a "Category One" cycling climb, and the ascent featured in the "Tour de Yorkshire" in 2016 and also in 2018 too.